Stop sending your food residuals to the landfill! Do you want your restaurant to become more environmentally friendly or more involved with the local community? Even if you just want to give your establishment’s marketing plan a boost, restaurant composting might be a great solution. According to the EPA, 60-80% of garbage produced by restaurants was food waste. By composting you can reduce your environmental impact by keeping waste out of the landfill, lower your waste hauling and disposal costs, and find a whole new way to connect with the people in your community! If your kitchen produces food scraps, give us a call at (404) 419-6887. 1. First, we will give you a quote based on the amount and location of your food scraps. 2. Next, we will provide you with all equipment needed. 3. Then, we will remove food residuals on regular frequent basis to avoid odor and nuisance issues, and convert it to nutrient rich compost. Use SGI for oil recycling, grease trap servicing, and now food waste composting and get a great package deal! Composting is the process of breaking down food scraps and other organic waste like grass clippings and certain paper and cardboard items using heat, moisture, agitation, air-flow and sometimes even earthworms (a process known as vermicomposting). It’s hard to imagine, but all of the organic waste that looks unappetizing when it leaves your restaurant can actually be turned into rich, dark soil through the process of composting. This soil can then be used to fertilize and enrich the land for local farmers and gardeners. Depending on the regulations in your area, you could even use the compost yourself for an herb garden or landscaped patio at your establishment. According to a restaurant food waste study conducted by the Business for Social Responsibility, about 84% of food waste ends up being thrown in the trash. Not only does composting prevent this percentage from growing, but it also has environmental benefits. 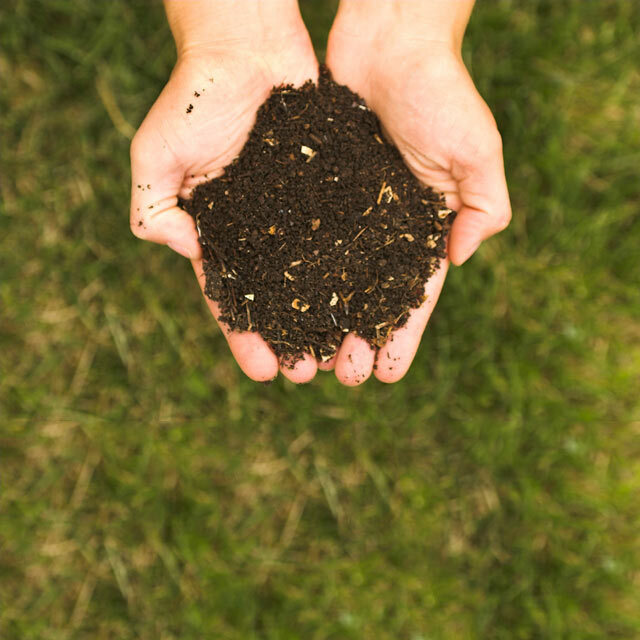 The biggest environmental benefit is the absence of synthetic chemical fertilizers in compost. When these chemicals are used in soil to grow fruits and veggies, we end up ingesting them. Synthetic fertilizers also run off during rainstorms and affect local wildlife. Using compost in place of chemical fertilizers yields healthier produce and has a less negative effect on the environment. Composting can also have economic benefits. With most of your business’s waste being composted, you can reduce the number of trash pickups your establishment requires and therefore lower your waste removal bill. Also, if your restaurant grows its own produce, then you can use your compost instead of purchasing expensive fertilizer. Step 1: Call us to discuss the options and costs. Every kitchen is unique. Let us help you determine the proper equipment, pickup schedule, and training program that will best serve your facility’s needs. Then we will provide you with an exact quote for the costs. Once all that is determined, we will deliver you equipment and start collecting your food scraps for composting! A composting program in your restaurant will be useless if your employees don’t understand or care about it. Taking the time to make all of your employees, from cooks to bus boys, aware of what should go in the compost and recycling bins and what should go into the dumpster will help to ensure that your business reaps the benefits of composting. Some composting facilities will even come to your restaurant to help train your staff on the process. Additionally, the busyness of a commercial kitchen can be a deterrent to conscientious composting, so you’ll want to have multiple compost bins located in prime areas throughout your business. This will make it quick and easy for your employees to responsibly dispose of organic waste. Making signs and posting them around your kitchen and other employee areas will help remind your staff to keep up with the composting program. If you run an establishment where guests throw away their own food, then you’ll want to hang signs around those trash areas so that they know what should be disposed of in the composting bin. By using biodegradable plates, compostable take-out containers instead of non-compostable containers, you can further reduce the amount of waste your restaurant contributes to the local landfill. Using these products can also help to spread the message to your guests that you are serious about making more environmentally-friendly efforts. Make an announcement to your local community about your composting program. Communicating with your community about your composting efforts can help you gain their support and possibly even their business. You could even donate your finished compost to a local park or other public area, however this is something you would need to talk about with your composting facility and local planning council. Composting in your restaurant provides an effective way to manage food waste while making a positive contribution to a sustainable environment. Now that you know the steps involved, you can begin implementing a composting program in your restaurant.